travel through the Ozarks platteau in 5 states. You remember the beautiful giant tulips, I planted? A different color display every year? Last fall, for the first time in a long time, I simply did not have the energy to make the massive planting. Multiple sclerosis and fatigue ruled my world. No more tulips. So this morning, my heart soared to see these few tulips in bloom. They are Darwin Tulips a few from last year and a few from the year before. The blooms are half their original size. Not what they used to be, but stubborn and still around. Now that’s a blooming blessing, don’t cha think? Late and long-lasting,Thalia daffodil tries to steal the show. Tulips are blooming from last springs display. Vegetable broth is easy to make, vitamin-rich and flavorful. Veggie broth at my kitchen turns out a little different every time, depending on what kitchen scraps are available. For example there are no tomatoes in the broth this time of year but plenty long-storing aromatics like onion, garlic, carrots and celery. Make it you own, adding what you like to eat. Start with what you have and take advantage of reduced-price and overstocked grocery store vegetables. I always have onion and garlic root tips and tops, the leaves and base of a celery stalk, carrot stubs, parsley and mushroom stems. I always add some dried herbs, pepper flakes or peppercorns and a bit of salt. Or, leave out the salt and add a piece of nori. Wait until you using the broth in a recipe to adjust the salt, herbs and spices. As you prep vegetables, freeze the vegetable scraps. I keep a big zip-lock bag in the freezer and place all vegetable trimmings in the bag as you prepare meals. Peelings and tough stem are loaded with nutrients. Use the tough stems and ribs of asparagus, kale, chard, and herbs. Root vegetable peels like onions, potatoes, and parsnips go in the bag. Use green onions, carrots, green beans, celery tops and tips. 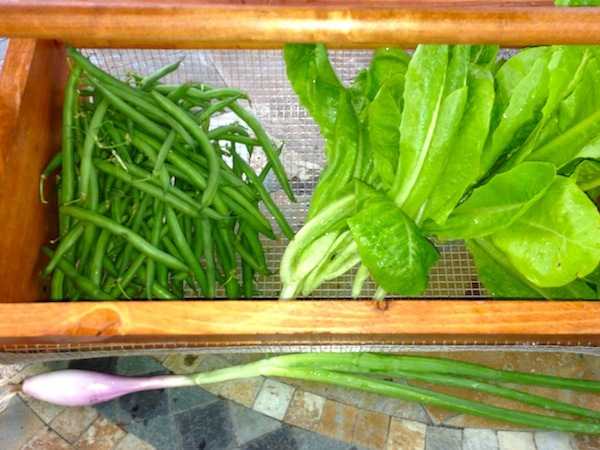 Include those neglected veggies in the crisper. Adding onion skins and mushroom stems will create a darker, richer colored broth. Cook vegetables in a large dutch oven until softened, about 5 – 10 minutes, stirring often. Add 8-10 cups of water, frozen vegetable scraps, bay leaves, whole herb springs, parsley, and garlic cloves, even nori or miso if you like. Reduce heat to medium-low and simmer, partly covered, for 45 minutes to an hour. Pour the broth through a fine mesh strainer into a large heat-proof bowl or pot; discard solids. Let cooked vegetables slowly drain, but do not mash the vegetables, if you want a clear broth. If you are starting with fresh vegetables, scrub everything. Chop in consistent sizes, like one inch chunks. Drizzle with a little olive oil. Sprinkle with the salt and pepper. Spread over a parchment lined cookie sheet and roast at 400 degrees for 15 minutes. Stir vegetables, add whole cloves of unpeeled garlic and whole springs of herbs such as thyme or rosemary. Roast a total of 25 to 30 minutes. Stirring once or twice during cooking. If the vegetables are not roasted and fork tender, stir again and place in the oven for five-minute intervals until vegetables are soft. Take care not to burn vegetables. The goal is to caramelize the vegetables. Caramelization brings out a nutty flavor and sweet, golden brown color. Add vegetables to a large soup pot or dutch oven. Pour in 8-10 cups of cold water, bay leaves, whole springs of parsley, thyme and oregano (your choice). Bring to just boiling. Reduce heat to slowly simmer, partly covered, for 45 minutes. Turn off heat. Allow the broth to cool until you can safely handle the next steps. The strained broth is clear and golden. Dried mushrooms, onion peels, a teaspoon of miso or a bit of nori will bring the broth another layer of flavor. Pour the broth through a fine mesh strainer into a large heat-proof bowl. Discard solids. Let cooked vegetables drain, but do not mash them, if you want a clear broth. Pressing the vegetables into the strainer will result in cloudy broth. For the clearest broth, stain again using a colander lined with cheese cloth or coffee filters. • Add flavor and nutrients to any dish buy cooking with vegetable broth instead of water. Broth is an excellent soup base. Use it to cook risotto, couscous, or to simmer vegetables. • Substitute broth for water in casseroles, baked rice, or pasta dishes. It is great for rehydrating vetetables, sun-dried tomatoes or dried mushrooms. • Get Well. This nutrient dense flavor booster is just right if you have a sore throat during cold and flu season. Add the juice of a half lemon. As you begin to eat foods again, simmer a few noodles or favorite vegetables in the broth. Keep broth refrigerated for up to 2 days, or freeze it. I freeze veggie broth in 1 cup or 2 cup portions and even freeze plastic quart containers of broth for soup base. Measure broth into individual containers and freeze. Remember, liquid expands when it freezes. After the cup size containers of broth are frozen, pop the broth blocks out of the container and store in a zip-lock freezer bag. If you are feeling lucky, store in quart size zip-lock freezer bags. Be sure to leave room for expansion when the broth freezes. It boosts my confidence to put the filled quart zip-lock into a larger one gallon bag just until it freezes solid. It costs nothing to make food taste richer. Vegetable broth is free flavor. Vegetarians and vegans are sprouting up everywhere this spring! Pansies and lettuce. Grow edible flowers and spring greens together. Photo pbh. As a lifetime gardener and resent vegan, I want to share my growing enthusiasm. Grab a package or two of seed and let’s get growing. 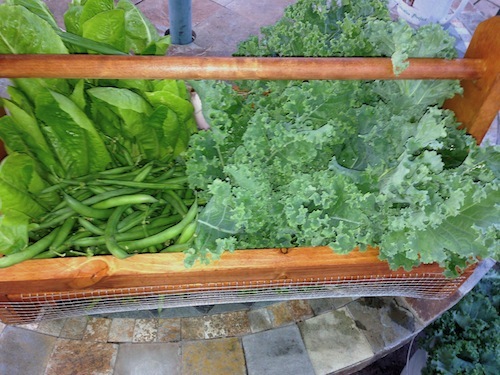 Now is the perfect time to start salad greens, kale, radishes. Start seedling indoors to transplant in the spring garden in a few weeks. Even if you don’t have a garden, many of us can find space on porch steps, a window sill, or a five gallon pickle bucket by the driveway. All you need is a sunny spot. Access to water is handy. Give them a little soil in a sunny spot and seeds will grow. A 4′ x 4′ raised bed is ideal but any container or an abandoned leaky bucket will grow a few green sprouts. Containers don’t have to be fancy. Just make sure there is a drainage hole in the bottom. Thinned baby Napa cabbages growing in toilet paper roll planters. Photo pbh. Grab some seed, it’s easy to find this time of year, and plant something, anything. Cool season crops, are vegetable plants that grow best in the spring. You can grow and harvest these early greens well before it’s warm enough to plant tomatoes, peppers and eggplants. Grow your own salad. Try lettuce, spinach, radish. Plant a few seed and wait to plant a few more seed in a couple of weeks to stretch out your harvest. It’s OK if you plant to closely, just thin out the seedlings and eat them. Now is a good time to start cool season herbs, like chervil. These fragile greens are hard to find and expensive to buy. They are the gourmet privilege of home gardeners. There are lots of seeds in a packet. Plant a few and wait to plant a few more seed every two weeks all through the spring. Add those thinings to your salad bowl, they are loaded with nutrients. Spring greens will tell you when it’s time to stop planting. Cool season crops bolt (go to seed) and turn bitter when it gets too hot. Save any remaining seed for a fall crop. I can’t resist the cheap seeds in the grocery and drug stores. Still, I buy most of my seed online from trusted seed companies with high germination rates. Renee’s Garden : Chervil, cilantro, baby pak choi, a variety of lettuces, and several types of radish. Sun, water, seeds. It’s all you need. Any container will do. I’m growing flowers in a couple of leaky watering cans. We might not eat this much garlic in a year, but when we have plenty of good fresh garlic, we eat more of it. Harvested garlic needs to be cured to help it last longer. Back in the day when we bought it one head at a time, we used garlic less and it wasn’t as good. 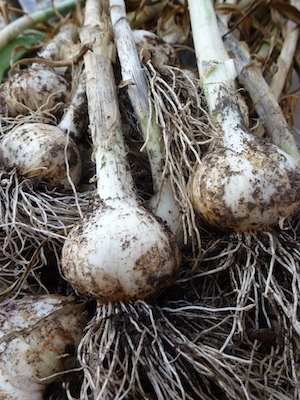 If you want to try your hand at growing garlic read my Hub Pages: How to grow and harvest garlic Look for garlic now to get the best choice. Order it now and it is mailed to you at planting time. Don’t plant grocery store garlic. It may be to discourage sprouting. Purchase bulbs from mail order or online suppliers, garden center, or locally at farmers market. Gently lift garlic and move to the shade. Watch for the yellowing of the plant leaves. When about half of the leaves have turned yellow/brown, stop watering two days before harvesting. Do not pull garlic. 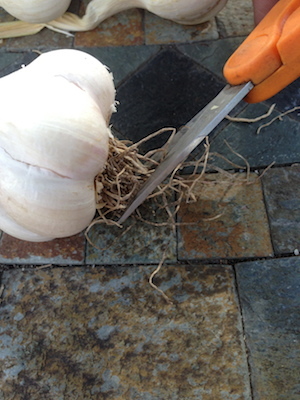 Carefully lift garlic out of the soil. Garlic can bruise if not handled carefully. Move to the shade as soon as possible. Spread out in an airy spot for drying. If the weather is wet, dry garlic indoors or in a garage. I used the shaded, screened porch and the garage. Dirt will dry quickly. Gently brush off the dry dirt. 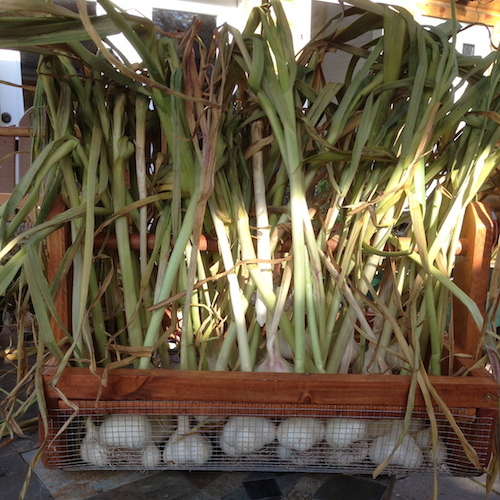 It is important for garlic to cure or dry in a cool, shaded space. Drying garlic needs good air circulation. Do not remove the leaves and roots while the garlic cures. The bulb draws energy from the leaves and roots until they are completely dry. The bulbs are ready to store when the skins are papery and the tops and roots are dry. Remove any dirt and trim off any roots and tops. Look for any damaged or bruised bulbs and discard them. Garlic bulbs may be stored individually with the tops removed, or the dried tops may be braided together to hang in the kitchen or pantry. Trim roots to within 1/4” of the base. If braiding the garlic, do this while the leaves are pliable. If you wait until the leaves are completely dry they will be too brittle to braid. When these little bulblets form, use them for a milder garlic taste. I plant garlic in late October or early November. Work plenty of compost into soil. Start with good soil and fertilizer isn’t needed. Don’t worry about planted garlic cloves freezing. They are a ok. This garlic was harvested late June. Last year it was harvested in mid July. Most of the garlic heads are plump, unblemished and about 2″ in diameter. I will make pickled garlic and add some fresh cloves the the herb flavored white wine vinegar. But please, please do not store raw garlic in olive oil. It can kill you. If raw garlic is stored in oil at room temperature, botulism (clostridium botulinum) develops quickly. It can be deadly. Even if raw garlic in olive oil is in the fridge for an extended period, it can kill you. Just don’t do it. Ever. The drug company MERCK, is terrorizing the American public with those horrible shingles shot advertisements on TV. The ads are really scary. But if this shot will protect me from the fresh hell of shingles, I want it. By shingles shot, I mean ZOSTAVAX, a vaccine used to prevent Shingles (also known as zoster). The pharmacist at Walgreens gives me the $200 shingles shot for an additional $20! “It only works for 50% of the people who get the shot”, she says. I’m thinking SOMEONE, like the doctor, the doctors assistant, the pharmacist, the pharmacists assistant could have mentioned that the shot is only 50% effective BEFORE they gouged me or my insurance company for $200. A 50 – 50 chance of the shot working, would be a deciding factor for a lot of us. AND, by the way, Walgreens, if I had known you were going to charge me $20, I’d have given myself the shot. For more information: ZOSTAVAX vaccine (MERCK) Merck Sharp & Dohme Corp., a subsidiary of Merck & Co., Inc., at 1-877-888-4231. Walgreens.com I got my shot at WALGREENS 3338, 1 S KINGSHIGHWAY ST, CAPE GIRARDEAU, MO 63703 (573) 339-1700. This photo of a quilt has nothing to do with shingles. It’s just a beautiful work of art at the National Quilt Museum in Paducah, KY.
Read about the huge film crew that accompanies the Gone Girl actors and staff. It’s here, Gone Girl in Striped Pot in the little boutique travel magazine I sometimes write for. There really are some great writers at Striped Pot. But I digress. There are a lot of security guards around town. They are protecting the movie sets and all the paraphernalia that travels with a film production. Mostly the guards are well equipped with paperbacks and soft drinks. But at least they won’t shoot you if you stick your finger in the “snow”. (Although they are very sharp and would never let you get that far in damaging any of the set.) It’s 70 and sunny here in Cape. 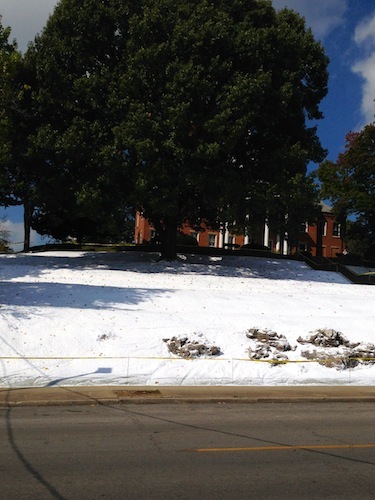 So seeing the snow covered courthouse lawn just makes me smile. There are lots of curious onlookers, like me. It is our tiny glimpse into the world of film making. (the gardener in me is happy for rain todays. The film crew, not so much.) This is a big deal for Cape. Our little town is no more than a river boat stop between St Louis and Memphis. The book, Gone Girl, is a “page turner.” I even received the marathon reader badge at Audible for this book. It’s not the kind of book I would not normally read without a recommendation. But, this thriller by Missouri writer Gillian Flynn has put her on my watch list. I’ll be looking for her books from now on. The movie stars Ben Affleck, Rosamund Pike, Tyler Perry, and Neil Patrick Harris. There is a full cast list here. I went flying to the page to see who was playing other roles in the story. “Gone Girl” is expected to be released in theaters in late 2014 or early 2015. Four O Clocks have always been a part of my life. Which is to say, they’ve been around for ever. When I was a child they were solid bright pink and yellow. 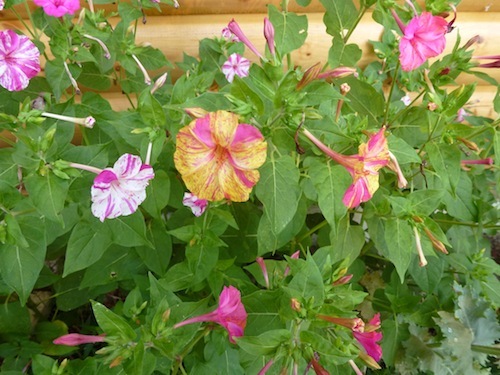 Todays Four O’ Clocks are still beautiful, timely and fragrant. I bought the seed at Renee’s Garden http://www.reneesgarden.com/ . These “Broken Colors” are producing lots of seed right now. And, with any luck, they will self-seed where they are growing. If not, I’ll plant some of the fallen seed I’ve swept up on the sidewalk. The seed are easy to see and easy to collect. Their delicious jasmine fragrance will have you looking for reasons to walk by them. As heirlooms, you can expect the new plants to look like the old plants. 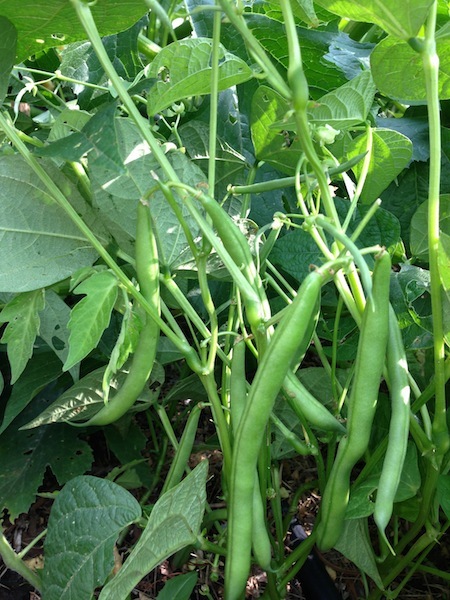 Renee’s Garden seed is 40% off of all 2013 seed right now. Buying these seed is a good deal, they will grow for you next spring. Check out your other favorite seed suppliers, many have seed discounts this month. Becky is in the hospital that does not allow flowers in the rooms. So, not to be deterred, I’ll send them on Pinterest. I can add a bit of description or comments here, where there is room. 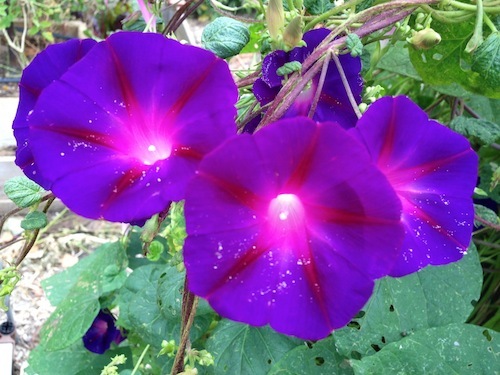 Grandpa Ott’s Morning Glories. Ah, a flower for mornings and sometimes a cloudy day. This is a sweet old heirloom. Morning coffee on the deck is a delight. The hummers love these blooms. What a great way to start the day. Good coffee, dozens of flowers, buzzing hummingbirds.